Coach Dion: HMC: a little up, a little down, a little up a little down! HMC: a little up, a little down, a little up a little down! What a weekend for running. ..
Did you see the Diamond Leagues? No I wasn't running either of them but the telly was on and they didn't disappoint. Owen set us off before the sun was up and I took off down the road with the whole field on my tail... the downhill didn't last long as we turned off the road and onto the mountain trails. I was joined at the front by Dylan and to my surprise the two of us started to open a lead! With Nic and Martin in the field behind I didn't think they would let us get away. There was no sight of Bernard who had found another lift to the start the night before so I didn't have to pick him up! 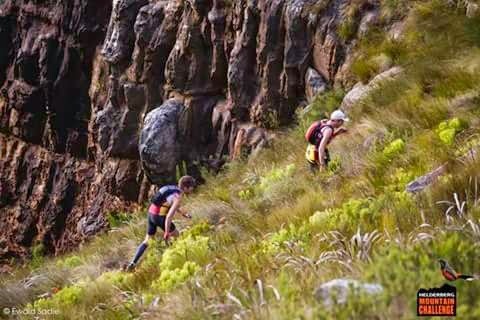 I kept the pace honest and hoped Dylan would blow (not very friendly of me...) But after falling to pieces two weeks ago at Jonkershoek things were going a lot better! If you haven't run the race let me tell you this: last year the race had scared me and I wasn't planning on running it again! Scared yes scared of falling off/down the mountain, some places are so steep it's not for the faint hearted! Back to the race, it took us about 25min to reach the real climb! No more gravel. I looked back and guessed we had about 60sec on whoever was chasing. That wasn't going to be enough for me to keep them at bay! But there was still lots of climbing to do and I had Dylan to drop, so I pushed on! I thought I had the better of him as we hit Porcupine Buttress. We weren’t fast, but our lead was growing as we pushed on to West Peak. I scrambled up a couple of rocks and hit the flat bit before the last climb to the check point. Plan one win the King of the Mountain, tick (I didn’t take the title as someone in the 15km was faster). Plan 2, not get caught before the 2nd climb. I lead the down and Dylan and I chatted as we dropped off the high points of the mountain and onto the contour. 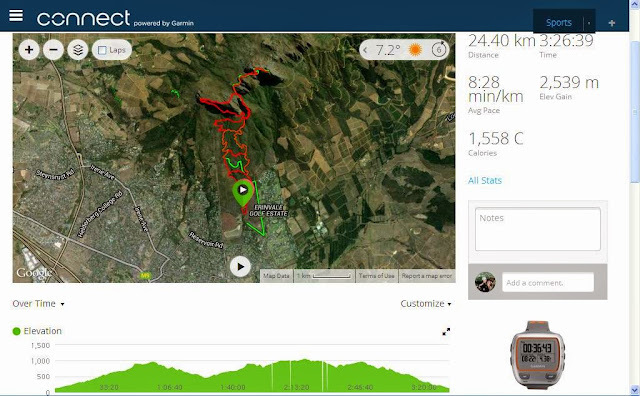 I wasn’t putting the body on the line, I was thinking 3h00-3h30 of running and just ticking along. At the end of this “contour” we had to slide down the gully to the next contour before dropping to the gravel road and heading back up. Someone was chasing hard but was still 60+sec back and we were climb again, so I reckoned we would open the gap again. We didn’t! It was Bernie chasing and he caught up on the climb, he had started 7 minutes late and had worked hard to pass the rest of the field and catch us. I was still leading and I think Bernie was happy in 3rd with the 2 of us, but Dylan was feeling good and the steady pace we had set for the first loop had left him with energy, so he kicked pass me. (Maybe I should have gone with him, but maybe I would have blown). I stepped aside and told Bernie to chase, he did, but not with the speed he had caught us and Dylan pulled ahead. I thought I would close on Dylan as we climbed Porcupine Buttress, but NO he was now 60-90sec ahead. You can see the top of the Dome in the distance, Jaco is climbing up while others are heading down, it's not far now Jaco! It wasn’t enough because Nic caught me before the saddle. Last year at this stage I was a broken man, but not this year, and while we had to pass the tail end of the 15km race I was about to push (politely) through the field and close the gap Nic had opened, all too late as he whizzed through the check point at the top and down out of sight. I was moving ok and passing lots of the 15km guys who were all more than happy to let us pass. On lap one I had stayed upright on the descent down the gully sliding on my feet, this time round with tired legs I was leaning back onto my hands as well. The rest was easy and I ran strong for the last 5km in… Bernie had caught Dylan and finished about 17min ahead of me with Dylan about 15min ahead of me, while Nic had opened 6min… Back to the drawing board for me I need to close the gaps that are opening in the last downhill km, or am I just getting to old to dance down the mountains? How can you dance down the mountain with all those boulders in the way? I'd be crawling down on my hands and knees. Staying upright would be a huge achievement.